The RX100 is an un-painted version of the 105SC/8. The RX100 has a Silver clear anodized finished on the aluminum clamp pieces while other steel pieces and its assembly or the same as the 105SC/8. Details: Shimano RX100 was designed to provide a feeling of both style and high performance to the affordable lightweight sport bike. Featuring advanced Shimano functions like SIS, HG sprockets and SLR brakes. 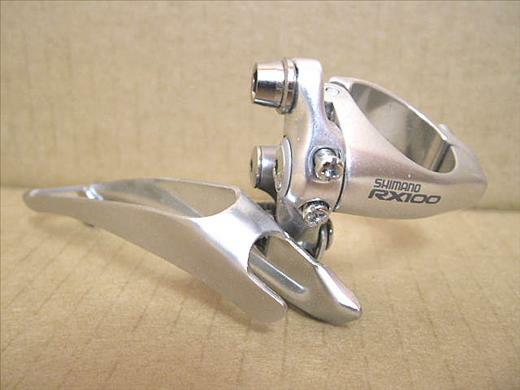 RX100 gives the entry level road bike the potential for performance in the Shimano tradition. Optionally available in a striking pure white colour treatment. Shimano RX100 components make possible a fashionable sport bike that's as beautiful as it is affordable.